Today I realized, it's really and truly spring. It wasn't because of the appearance of robins although they have been around too. http://pixiedusthealing.blogspot.com/2012/02/animal-signs-robin.html It wasn't because of melting snow, or the appearance of Spring Bunny stuff in the stores. Those can be somewhat unreliable signs I have learned. What really signals spring to me is something much sweeter- the sap is running!! In my part of the world when the temperature starts to swing dramatically between overnight and afternoon, the buckets come out, maple trees are tapped, and by the end of the afternoon you can have a full bucket of what looks like water. As kids, we somewhat impatiently watched the drips coming out of the spout and collecting in the grey tin bucket. A bucket full of sap meant we were "in business"! I can't imagine how the first person figured out to make maple syrup. When the sap drips out of the tree it's colorless, odorless and pretty much tasteless. We always found that tasteless part kind of hard to believe. But no matter how many times you dip your finger in the bucket or put your hand under the spout and try drinking the sap, it's going to taste pretty much like water- maybe not quite as good. Somewhere along the line, and a long time ago, someone figured out that if you heated the sap up long enough and most of it evaporated out, you'd be left with something totally different and something that, even today, can't be replicated with artificial "stuff". 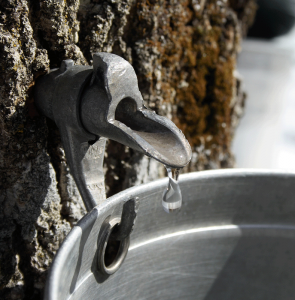 Nothing really tastes like sap that has been boiled down to maple syrup. Maybe it's the process that makes maple syrup taste so good. It's a lengthy process to make maple syrup. First you have to tap the tree, hang that bucket and wait, and wait, and wait. It's amazing how fast the drips will start to come of the tap once the temperature rises. It's also amazing how long it takes to fill a bucket when you're watching every drop! If however, you put your taps in and avoid looking at them till mid afternoon, you'll be pretty excited how much has accumulated! On a really good day, your bucket can even start to overflow. It's one of those things that you have "allow". A few drops of the Bach Flower Impatiens might be required if you find yourself trying to coax out the drips! Once you have the sap collected you need a hot fire and even more patience to melt it down. You can do this over the stove top. Your kitchen will smell heavenly. Your ceiling will become very very sticky!! For that reason, it's highly recommended that you boil your sap down outside. You start out with a lot of sap even from just a couple of trees on a good day. But you have to boil and boil and boil. Just about the time that your pot is almost empty, having had most of the liquid evaporate, you're left with a little bit of syrup on the pot. It's about a 40 to 1 ratio! That's a lot of sap for a little syrup and it takes a long time to boil it down to that point. More reason for Impatiens! Collecting and boiling down sap can be just a little addictive. If you're not careful ,you'll get a little crazy tapping trees. It's a lot easier to tap the trees than it is to keep boiling it down. It can be a long night if you're still boiling all that sap down round about midnight when the temperature has gone back down to minus 10 and you're standing out there "watching the pot boil". For that reason, it's a good idea not to tell Vervain types that you're making syrup! http://pixiedusthealing.blogspot.com/2011/03/allowing-instead-of-forcing-change-bach.html Vervain types will have turned your one bucket operation into a commercial enterprise in no time flat! Once you have the sap boiled down to syrup there are multiple things you can make from there. You can use it "straight" as syrup for pancakes or ice-cream or whatever you choose. You can use it as a sweetener the way you would corn syrup and make just about anything. You can further boil it down and make maple sugar. But my personal favorite, is maple candy. To make maple candy you need snow and a Popsicle stick or a twig. When the syrup is boiled down and still boiling hot, you pour the syrup out on the snow in a line. Then you take your stick and twirl the gooey stuff up onto the stick and you've got the best lollipop you'll you'll ever taste! Trust me. In my opinion, there's something about using a twig, and the snow (which we were were never supposed to eat) and perhaps just the fresh air and the fact that you've been waiting so long, that makes this really special. It's sticky and messy and gets stuck in your teeth- and for all those reasons- it's heavenly. I've lived in parts of the country where either there weren't maple trees or the temperatures weren't conducive to sap flow, and trees weren't tapped in the spring. That always made me fell kind of homesick. But you can adapt a bit. You can buy maple syrup, heat it up to boiling and pour it over snow or crushed ice and make maple candy. It's almost as good. And it's a lot of fun. I've spent a long few days listening to the impacts of Climate Change. Much of this is doom and gloom and some pretty dramatic science. But there are some real positive signs of changing climate. One of them is that the swings of temperatures may make for some really profitable maple syrup seasons. We're tapping trees much earlier around here and it's predicted to be a great year. Maybe some other areas of the country will find they too can make maple syrup. Maple isn't a Bach Flower essence. I think if it were it would be for an emotion somewhere in between Impatiens and Rock Water. It speaks to the need to be patient enough to go with the flow and adapt to changes and swinging temperatures or seasons in order to find the sweet spot in the middle. Maybe it would help us find opportunity in the mundane or support the ability to change the ordinary into something magically wonderful. Maybe it would help us connect to our inner child and just enjoy nature and it's sweet offerings.